Commissions created by undemocratic, corrupt governments are smokescreens designed to mask grievances raised by the people. They are intended to show "goodwill" to the international community, including international human rights watchdogs and foreign aid donors - so as to delegitimize the people's demands and escape reprimand. The government of Cameroon announced the creation of a commission to promote bilingualism in the wake of protests and civil disobedience in English-speaking parts of the country as a result of marginalization of Anglophones. As strange as this may sound - Cameroon has a national human rights commission - which is known as the National Commission on Human Rights and Freedoms (NCHRF). It may sound strange because more than two decades after it was decreed many Cameroonians have never heard about it, and the state of human rights in the country is still nothing to write home about. 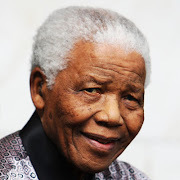 According to the Commonwealth Forum of Human Rights Institutions the human rights commission is an independent institution created by Presidential Decree in 1990, and by law in 2004. Its functions include receiving denunciations of human rights violations, conducting inquiries and visiting penitentiary establishments, popularizing human rights standards, liaising with NGOs and proposing human rights measures to the authorities. 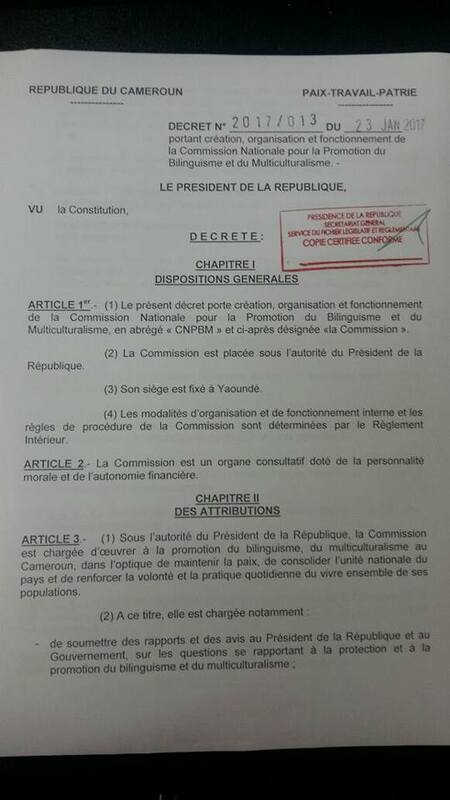 As a result of an on-going strike and mass civil disobedience in English-speaking parts of Cameroon another commission was created called the National Commission for the Promotion of Bilingualism and Multiculturalism. According to state-run CRTV it was created by Presidential Decree on 23 January 2017, and tasked with ensuring the "effective use of English and French as two official languages of equal value." Over the past couple of months the government of Cameroon has been struggling to quell mass protests and strikes by Anglophones - or English-speaking Cameroonians - in the Northwest and Southwest regions of the country. Anglophones, led by lawyers, took to the streets in protest of what is described as the "Anglophone problem" - a phrase used to describe discrimination and marginalization of English-speaking Cameroonians who make up twenty (20) percent the population. Lawyers in the two English-speaking regions took to the streets to protest erosion of the Common Law system and the imposition of French and French-speaking judges in Anglophone courts. Teachers joined the strike - protesting the "francophonization" of English schools. The oppose, among other things, the appointment of Francophone teachers with little or no English-language proficiency to teach students in English-speaking parts of Cameroon. According to an accountant in Bamenda, capital of the northwest region, he pays someone to translate his brother's schoolwork from French to English because Franchophone teachers sometimes teach in French - even though their students are Anglophones. Students and the general public in English-speaking parts of Cameroon joined lawyers and teachers in the strike, and as a result schools and courts have been shutdown since the closing months of 2016. The response of the government to the protest was typical: denial of the existence of an "Anglophone problem" - accompanied by a brutal crackdown on protests. Civilians lost their lives and many were beaten and arrested. The government banned the Cameroon Anglophone Civil Society Consortium (CACSC) and the Southern Cameroons National Council (SCNC), and arrested strike leaders and critics of the government, including Agbor Nkongho, Fontem Neba, Mancho Bibixy and Ayah Paul Abine. According to the African Commission on Human and Peoples' Rights (ACHPR) more than nine (9) Cameroonians lost their lives during protests in Bamenda, Buea and Kumba. As strike action and "ghost towns" persist in English-speaking parts of Cameroon despite government crackdown on civil liberties the government announced the creation of the National Commission for the Promotion of Bilingualism and Multiculturalism. This raises questions whether or not a commission is an effective solution to the numerous problems faced by Anglophone - problems which, according to many Cameroonians, go beyond language. Commissions do not solve problems in Cameroon. The are all smoke and mirrors. It follows that, I believe, the newly created National Commission for the Promotion of Bilingualism and Multiculturalism won't guarantee the "effective use of English and French as two official languages of equal value" in Cameroon. 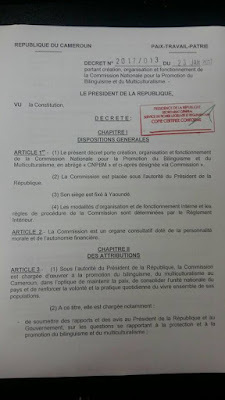 The commission won't guarantee bilingualism in the same way the creation of the National Commission on Human Rights and Freedoms (NCHRF) more than two decades ago neither guaranteed respect for human rights nor change the government of Cameroon's attitude towards human rights. The existence of a national commission of human rights has not made the state of human rights in Cameroon any better. Protesters are still being beaten, arrested,disappeared and some killed; associations are still being banned and their leaders arrested on trumped-up charges; and there is still impunity for crimes committed against civilians by state security forces. 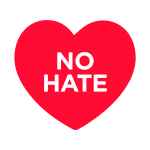 In the face of the recent full-scale assault of human rights in Cameroon following protests in English-speaking parts of Cameroon the NCHRF has been largely ineffective - due to a culture of impunity and lack of political will to respect human rights in Cameroon. It is fair to state that although the national human rights commission punches below its weight - it does some commendable work. For instance, according to information on its website (accessed on 25 January 2017) the Commission visited detainees held at SED and at the the Judicial Police in relation the protests in English-speaking parts of Cameroon, and helped release thirty four (34), including four (4) minors. However, there is a lot of room for improvement in the work of the Commission, especially in the area of human rights protection. Impunity for crimes committed against civilians is the order of the day, and NCHRF is saying or doing little or nothing about it. The bilingualism commission will face the same lack of political will faced by NCHRF. Eighty (80) percent of Cameroonians are Francophone and almost all top brass - people with the power to change things - in the government are Francophones. Ordinary Francophones also play a part in marginalization of Anglophones. Unless there is a change in their mentality toward Anglophones in Cameroon the Commission for bilingualism would not register any meaningful success. In addition, it might take years for it to gain the force of law. The human rights commission, for example, was decreed by the president in 1990 but gained the force of law in 2004 - fourteen (14) years later. CRTV's George Ewane pointed out (see CRTV link above) that the Commission for the promotion of bilingualism and multiculturalism is modeled on Canada's Multiculturalism Act and on the Canadian Royal Commission of Inquiry on Bilingualism and Biculturalism - which was, by the way, established in 1963. He failed to point out that the model works in Canada due to political will and strong institutions to support it. Cameroon lacks both political will and strong institutions, including a strong, independent judiciary to support the work of the Commission. There are some positives to be taken away from the creation of the Commission for the Promotion of Bilingualism and Multiculturalism. Its creation is represents acknowledgement of the "Anglophone problem" by the government. By creating the Commission the government recognizes the fact that there is a problem - a problem that has festered for decades. However, Anglophones should not put down their guard and become complacent - bearing in mind that a Commission cannot redress the situation. The struggle for equality should continue. If the government is serious about promoting bilingualism Anglophone Cameroonians should, for starters, also be appointed to serve in top positions that are currently filled with Francophones. An Anglophone Prime Minister with no real power is not enough. According to a Facebook post by Ayah Paul, former presidential candidate, leader of the Popular Action Party (PAP) and Advocate General of the Supreme Court, the President of the Supreme Court is a Francophone, the Attorney General is a Francophone, the Head of Judicial Division is a Francophone, the Head of Administrative Division is a Francophone, the Head of Audit Division is a Francophone, the Head of Special Criminal Court is a Francophone,the Director of Military Justice is a Francophone, the Registrar-in-chief of the Supreme Court is a Francophone, the Secretary General of the Supreme Court is a Francophone, just to name a few; decent roads should be constructed in English-speaking regions that have basically been forgotten by the government; Francophone judges and teachers who lack English language proficiency should be withdrawn from English-speaking Cameroon; all Anglophones arrested in relation to the Anglophone struggle should be released unconditionally; and atrocities committed by security forces, including killing of protesters should be investigated and those responsible brought to book. A return to Federalism as a form of government - or even secession - should not been taken off the table. According to the African Commission on Human and People's Rights (ACHPR) in its 26th Activity Report "the people of Southern Cameroon can legitimately claim to be a ´people´" since they have a "distinct identity which attracts certain collective rights." Under International law "a people" have the right to self-determination. Cracking down on those who nonviolently promulgate federalism or secession as a solution to the Anglophone problem is a violation of international human (and peoples') rights standards.